Temponeras signs LOI with Wittenberg Univ. 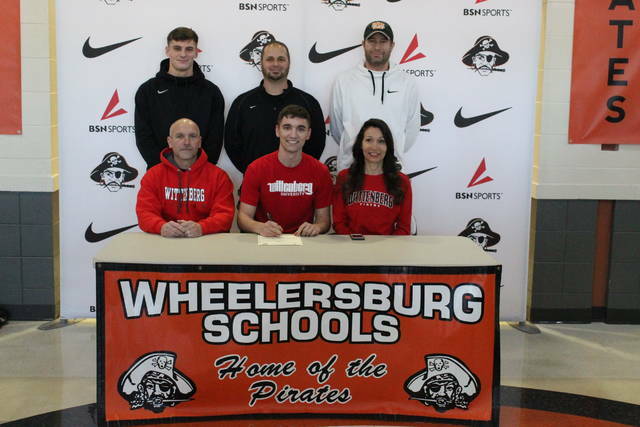 Wheelersburg senior Athan Temponeras signed his letter of intent Friday afternoon to play soccer at Wittenberg University beginning this fall. WHEELERSBURG – It’s not so often that you’re given the opportunity to play a sport at the collegiate level after having just two years of experience with the sport. Yet, Athan Temponeras is getting that opportunity after signing his letter of intent to play soccer at Wittenberg University, a sport he picked up beginning in his junior year at Wheelersburg. “I’ve loved the past two years, being able to play soccer,” said Temponeras at his signing Friday afternoon. “It’s been great after I made the switch from football to soccer, and I’m really excited to get started at Wittenberg. Temponeras has been an integral part of Pirates teams, both on the baseball diamond as well as the soccer pitch, over his high school career. His efforts on the attack for the soccer team last fall helped lead the Pirates to an outright SOC II championship, a sectional title, and an appearance in the district finals. Wittenberg is an NCAA Division III level program in Springfield, Ohio that competes in the North Coast Athletic Conference (NCAC). Temponeras plans on studying pre-law while attending Wittenberg. In addition to the great memories made on the field, Temponeras says he’ll never forget the support his friends and family have given him while playing at Wheelersburg.